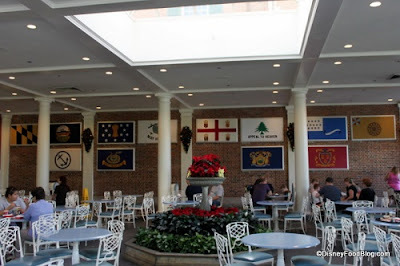 Okay, so I'm not trying to get up on a high horse here,* but there is one Walt Disney World behavior I simply do not understand: in all the food joints in all the World Showcase, why would you walk into the Liberty Inn? * I would happily accept a low horse. Any horse at all, really. Epcot is an epicure's dream. Well, ish. I mean, a lot of the restaurants are serving native food and drink that some would accuse of being dumbed down for tourist palettes. But still, you've got Moroccan spices, a full English pub, Bavarian pretzels as big as your head, gravlax and weird Norwegian liqueur, A WHOLE CAVE OF TEQUILA, and you choose... a domestic beer and a burger in the American Adventure's quick service restaurant. In the modern parlance... wut? I suppose you could argue that not everyone who visits WDW is American, and maybe those international visitors find American cuisine interesting. I'm not convinced at all that that's what's happening, but okay. But you can get burgers and fried shrimp lots of other places around the parks and resorts. Why wouldn't you take the opportunity to change it up a bit? The other potential defense I could see someone using is that their kids are picky. Fair enough. But I've never heard any parent utter any sentence along the theme of "My kid is so picky and I LOVE IT!" I can't think of a single better opportunity than the vast food pantheon of the World Showcase to find SOMETHING, ANYTHING EVER SO SLIGHTLY DIFFERENT your kid might deign to try. Why not seize your chance? Admittedly I am neither an international visitor nor a parent. I may well be jaded (yes), stupid (rather), or child-unfriendly (broadly). I just don't get why Liberty Inn is a thing. Do you? Some adults are picky too. I definitely don't get it!